My friend Maria recently told me about Kura. It apparently just opened in February, and it’s a really, really small restaurant with a sushi bar and one small table on St. Mark’s and Ave. A. There’s no set menu, and they only do omakase-style. Huey Chang and Chef Ishizuka run the restaurant, and they’re the only two cooks there. Anyway, I really wanted to check it out, so Monte, another friend, and I went a few days later! We started off with a few kappo-style appetizers, and then we gradually transitioned to the sushi portion of the meal. I say “gradually transitioned” because they started serving sushi while we were still getting appetizers (chawanmushi and the green tea soba). Chef Ishizuka is really, really nice and smiles and laughs a lot. He definitely made the experience more enjoyable! They ran out of food to give us out the end. I guess we’re fatties :(. 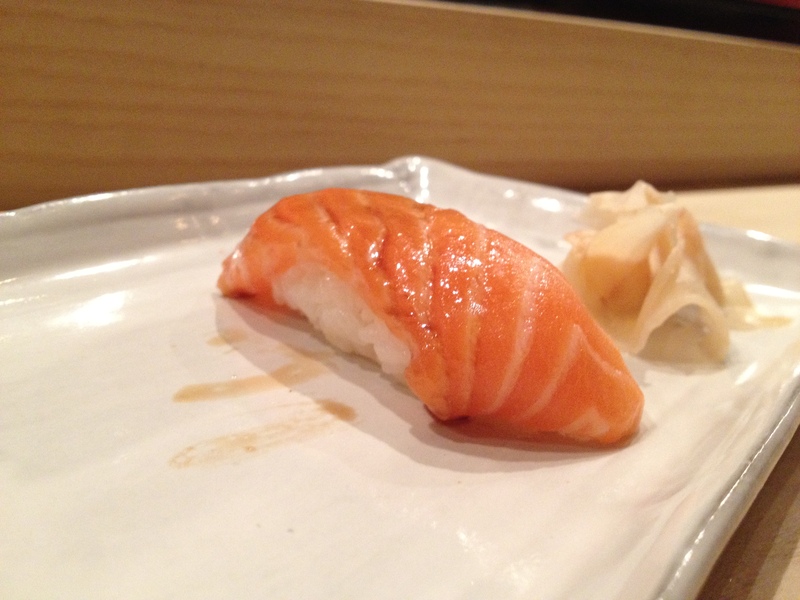 Chef Ishizuka did tell us to come back on a Tuesday or Thursday, though, when there’s fresh fish! -The fish we had was pretty fresh. He didn’t really have the rarer fish from Japan (kinmedai, shima aji, mirugai, Hokkaido uni, akamutsu, and so on), but this is apparently because he gets new shipments from Japan on Tuesday and Thursday and only wants to use what’s freshest? -The rice was really great in the beginning. However, it got worse later on—there was a time when he left the rice container open for about 15 minutes while we were waiting for our next piece (botan ebi). After that, the rice became colder and dryer. 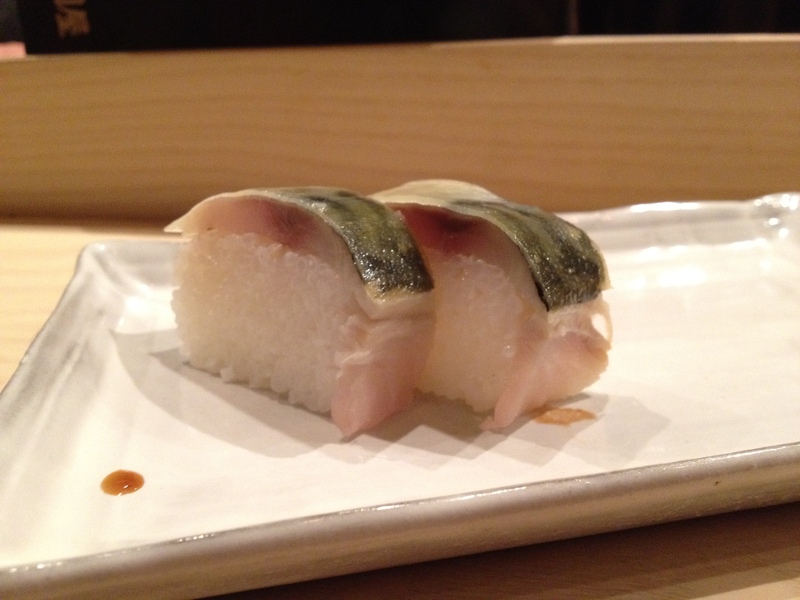 -The oshizushi (“pressed sushi”), also known as hakozushi (“box sushi”), was pretty great! Osaka is famous for its oshizushi, and I actually enjoyed eating that the most because it was so different from the normal edomae sushi that I’m used to. Ika mentai (squid with chili sauce and daikon). Monte: The squid had a wonderful texture to it, and had that crispness to the outside and tenderness on the inside, almost reminiscent of shrimp. I really enjoyed the chili sauce too, it added a nice contrast to the naturally sweet squid. Toro tataki with ponzu sauce. 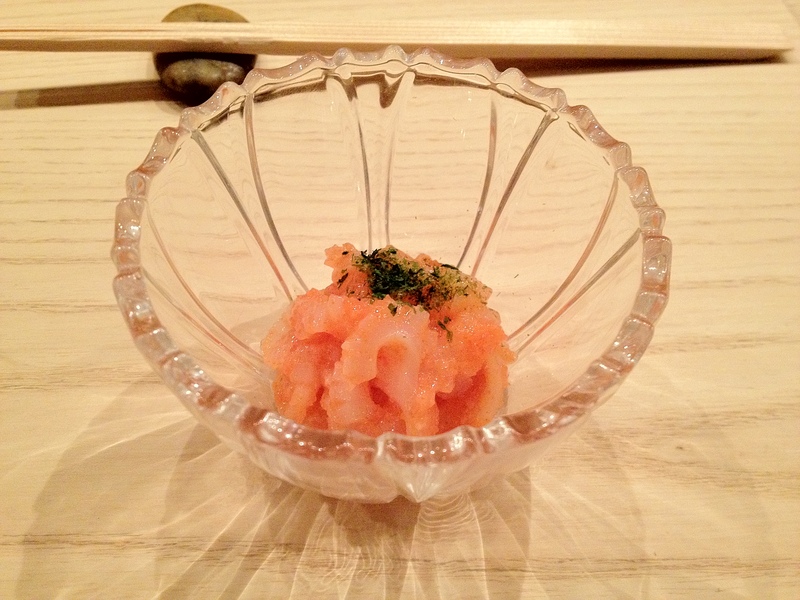 Victor: The ponzu was super citrus-y, and I think it made everything taste sweeter—I liked it. 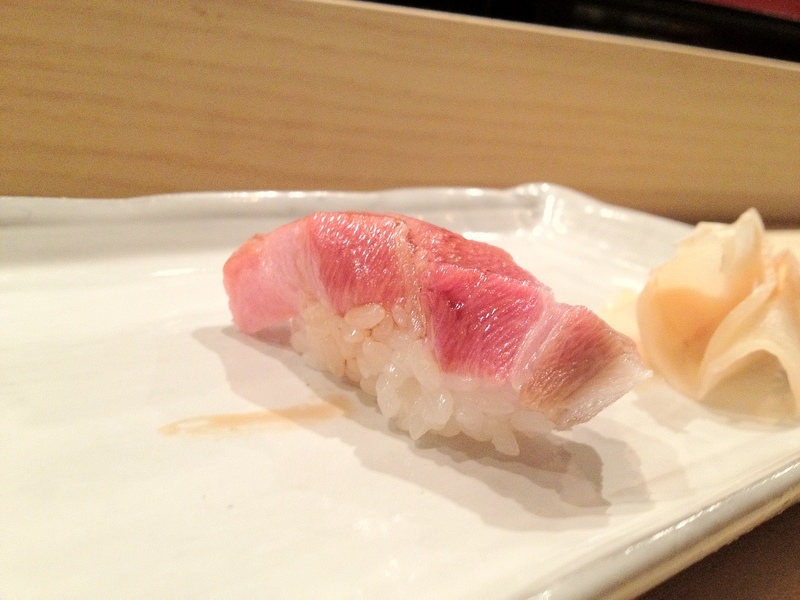 Monte: I strangely tasted mackerel flavors in the toro. 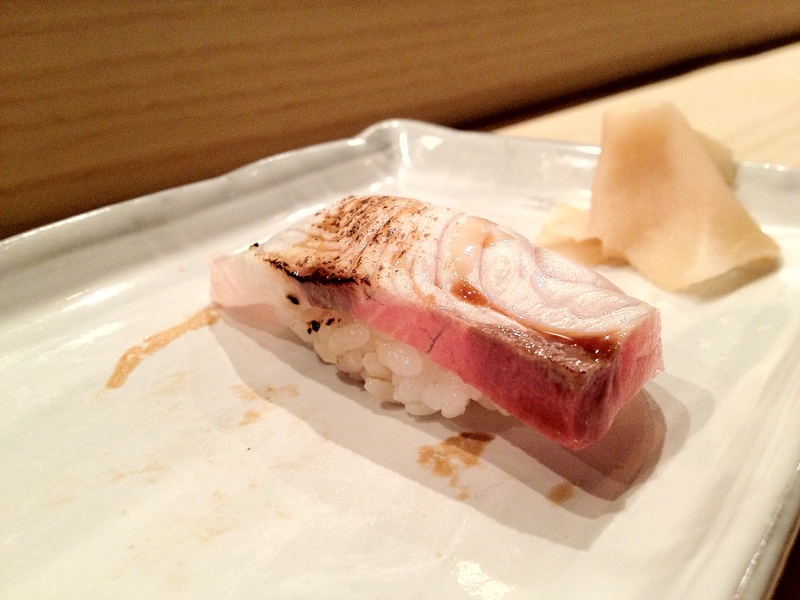 It had that salty and fishy flavor of mackerel, albeit the texture was undeniably toro. Not that I’m complaining, I love mackerel flavor. Just confused, I guess. 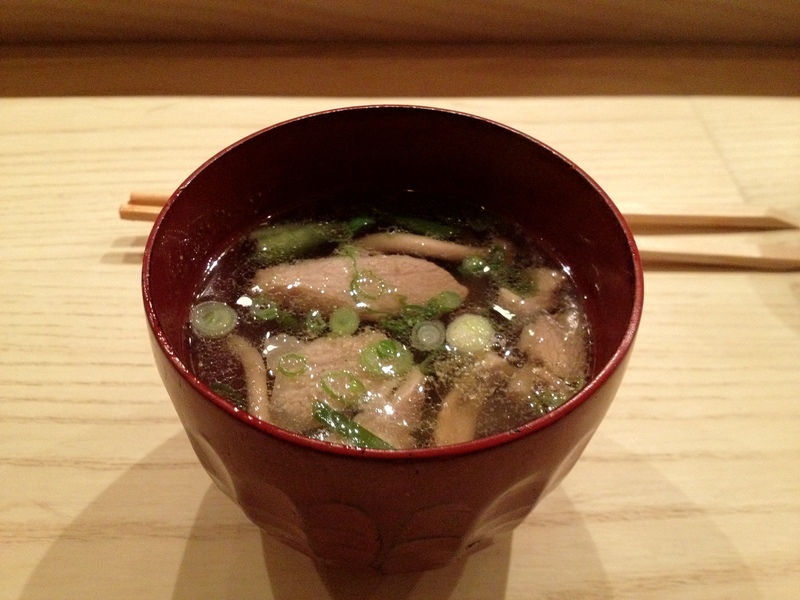 Toro dashi soup with shimeji mushrooms. Monte: Same comment as above about the toro. Great flavor and texture though, if at least not as-expected. The scallions and mushrooms were really sweet, and the entire broth was just brimming with what I can only guess is umami flavor – it was delicious. 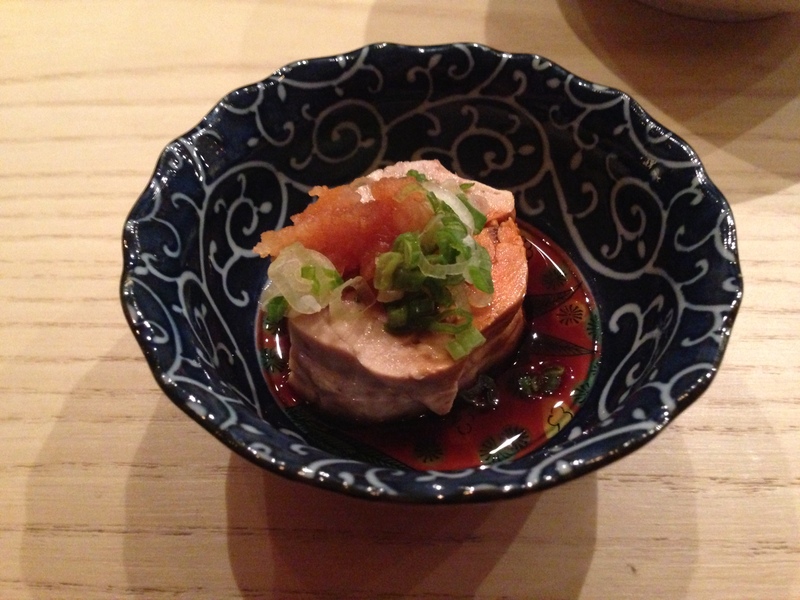 Ankimo (monkfish liver) with daikon, chili, and scallions. Monte: My love for foie and monkfish liver is not new – the creamy sweetness of the livers are just happiness on a plate. Kura’s was no exception. The mild spiciness of the chili and daikon added some brightness to the dish and kept it from being one-dimensional. 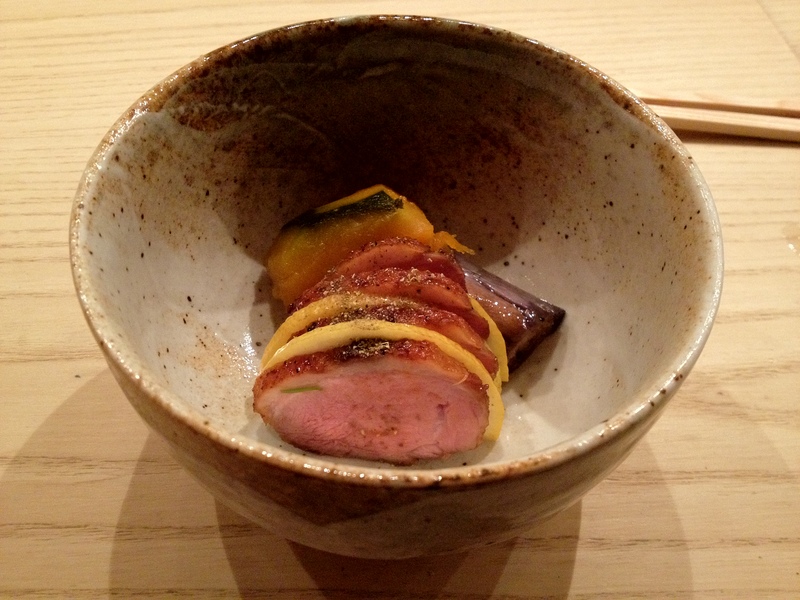 Roasted duck with slices of lemon, eggplant, and kabocha (Asian winter squash). 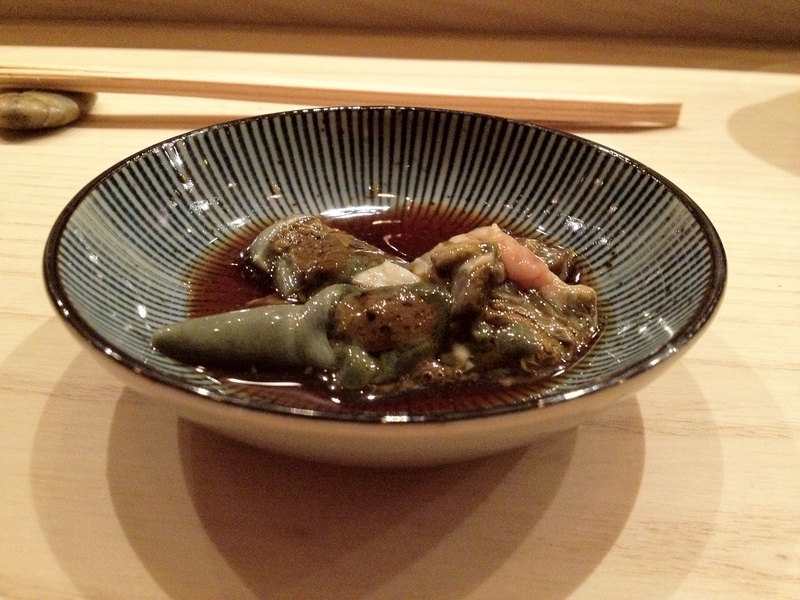 Victor: The eggplant and the kabocha were unbelievably rich. I actually preferred both to the ankimo, which says a lot about how amazing they were. The duck was very interesting and was both sweet and savory, but, to be honest, I could go without the duck—GIVE ME MORE OF THAT KABOCHA! I could eat pounds of that stuff. Monte: Another fantastic dish. All these kappos have been pretty amazing. I’ve been intrigued by ideas of how to add acidity into dishes, and its effects on taste. This dish definitely had a lot of acid – the duck had a sweet (like sweet miso) and sour (grapefruitish) taste to it, probably from some marinade, and sandwiching the duck between the lemon slices certainly made it pop even more. Victor: They served this while we were getting our first sushi piece, and I’m guessing it was meant to be a starter to the sushi pieces. Monte: Yummy. 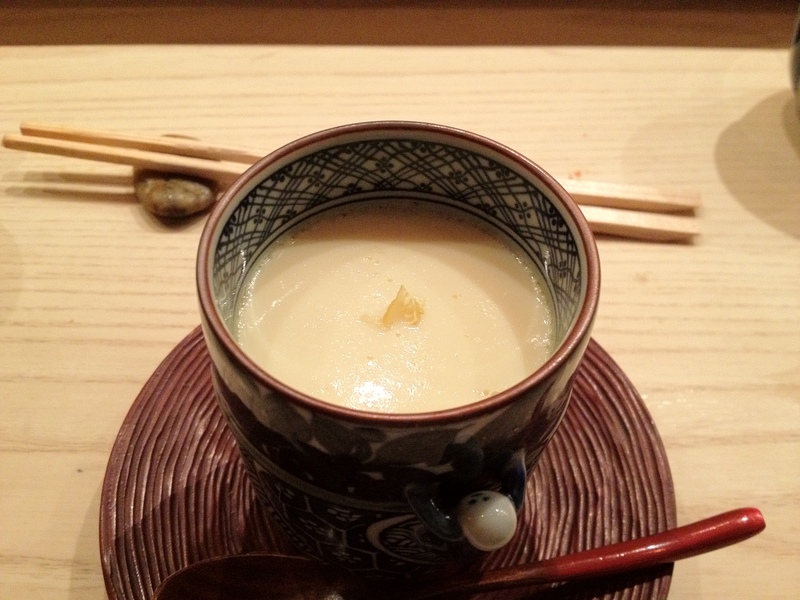 I love the silky smooth texture of this chawanmushi. It’s like soft tofu meets scrambled egg meets pudding. 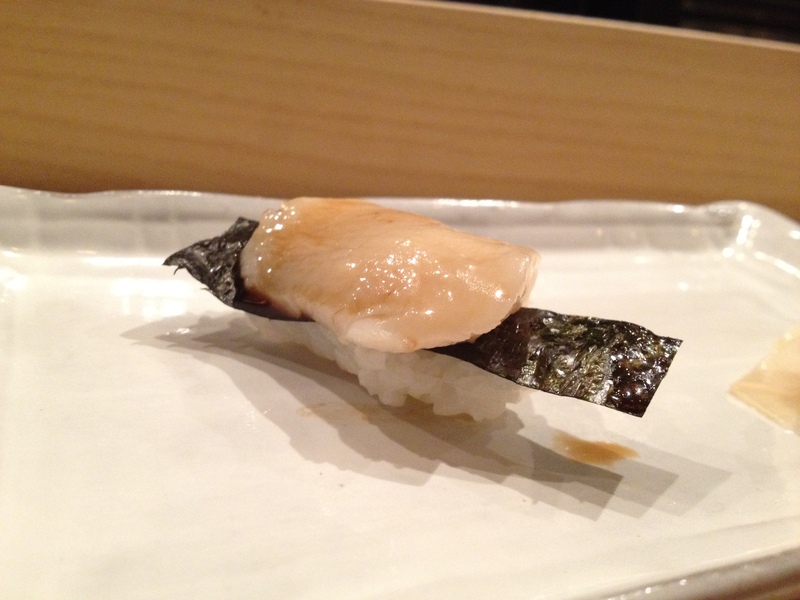 Hotate (scallop) with nori (seaweed). 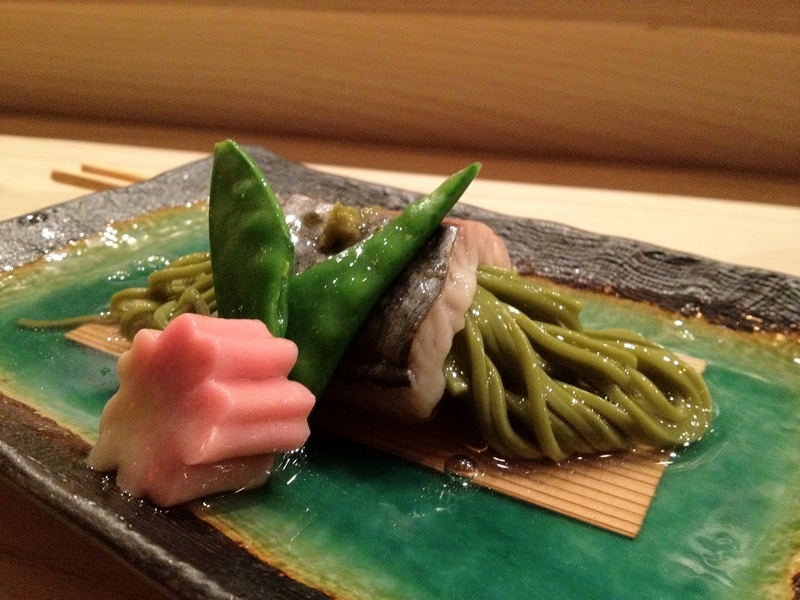 Green tea soba wrapped in sawara (Spanish mackerel) with snow pea pod, yuzu pepper paste, something like mochi or rice cake (but different, according to Chef Ishizuka), and kuzu broth. Victor: The timing of this dish confused, and continues to confuse, me a bit. Monte: Haha the flavors of this dish confused me. The earthy slightly bitter matcha flavors of the soba was interesting, but the gooey kuzu broth made everything just really different and unfamiliar. At first I tasted green tea, but then this cactus-like aloe-y kuzu broth just kind of dilutes the flavor. 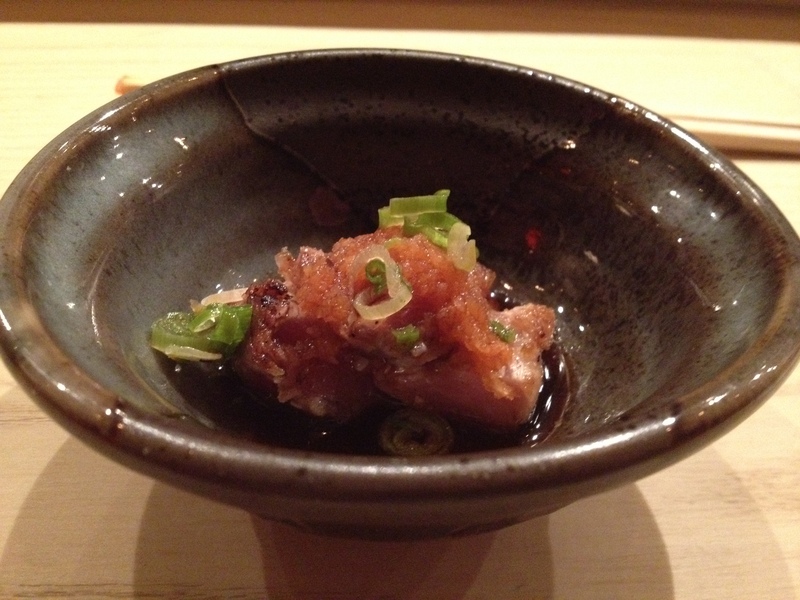 The salty fishy mackerel was great but then again, the kuzu broth mellowed out the flavor a lot. The dish was really cool, and though I’m not sure if it worked, it certainly wowed me with its (for me) novel flavors. Victor: The tamago had some shrimp in it, and it was definitely one of the more interesting tamago that I’ve had before. The taste of the shrimp wasn’t really strong, but it was enough to compliment and add to the egg flavor. 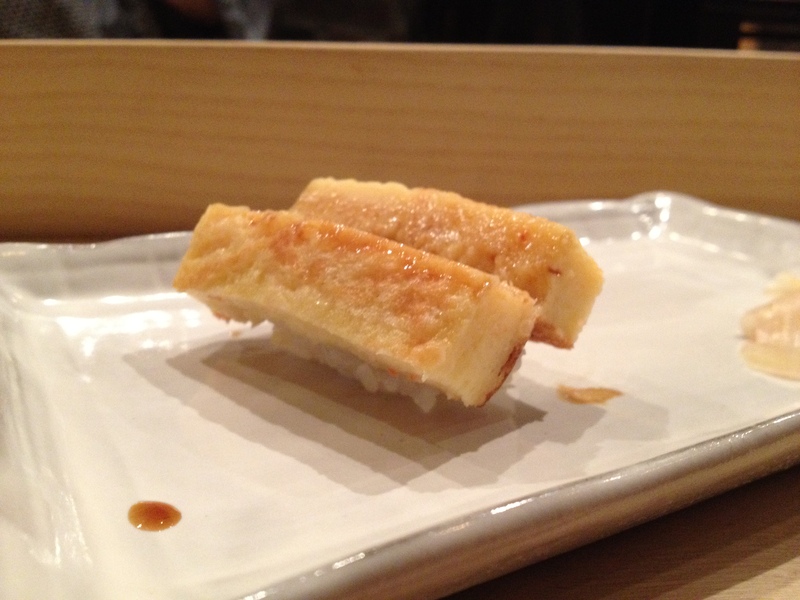 Monte: This tamago tasted like a cross between vanilla cake, egg custard, with the just the slightest hint of soy. It’s awesome. 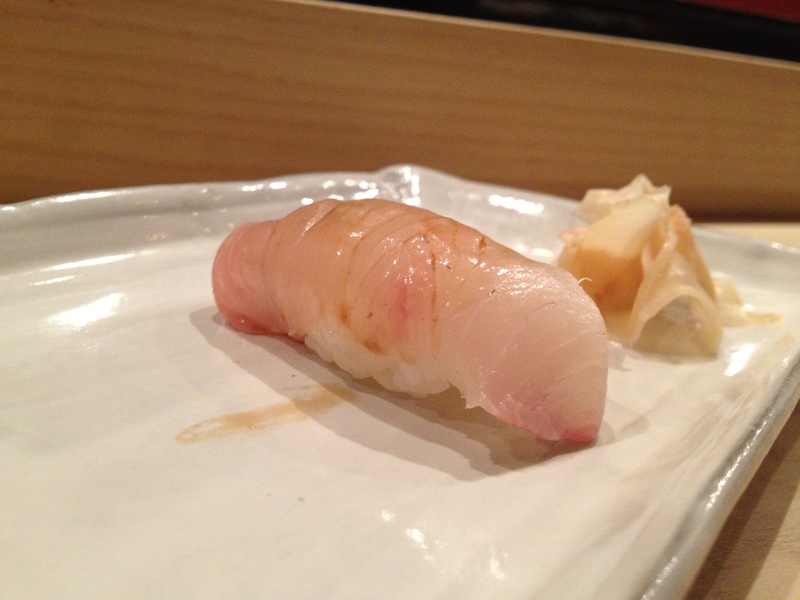 Oshizushi (a.k.a. 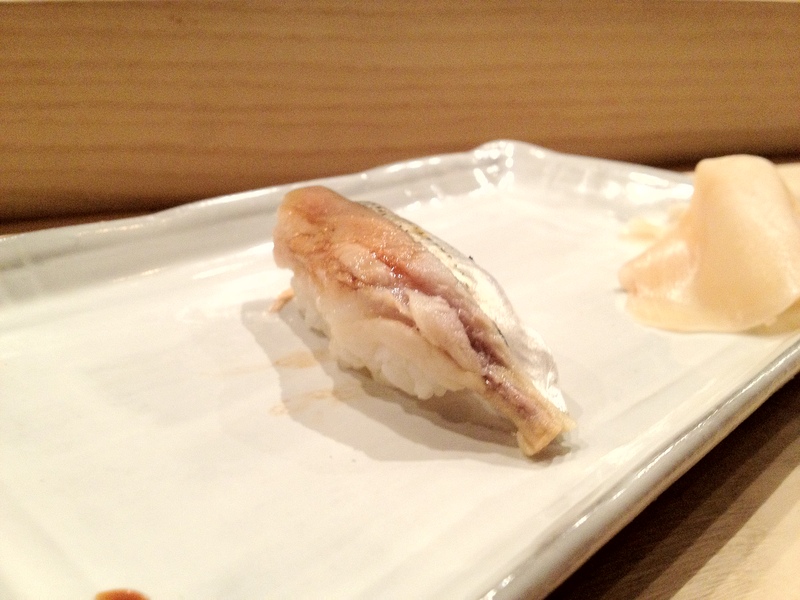 hakozushi) with saba (mackerel). 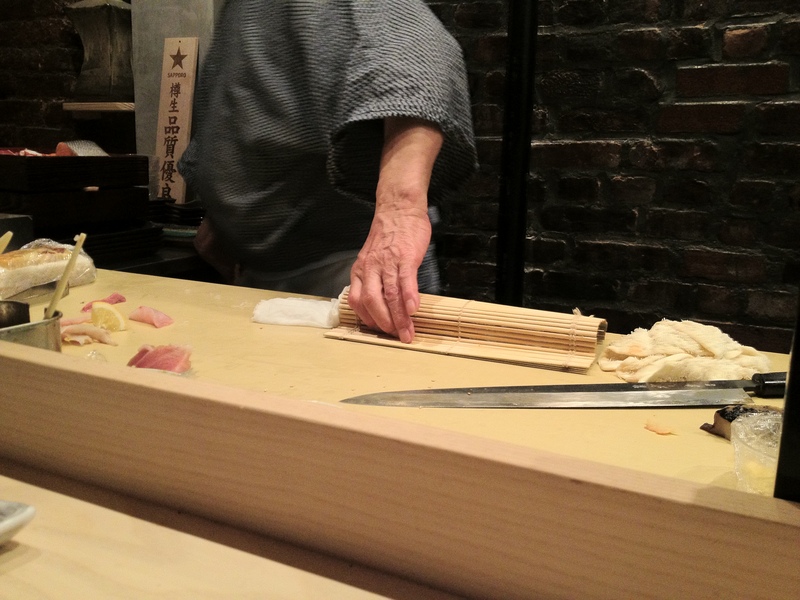 Victor: He prepared the hako-zushi by pressing it into a box shape with a makisu. 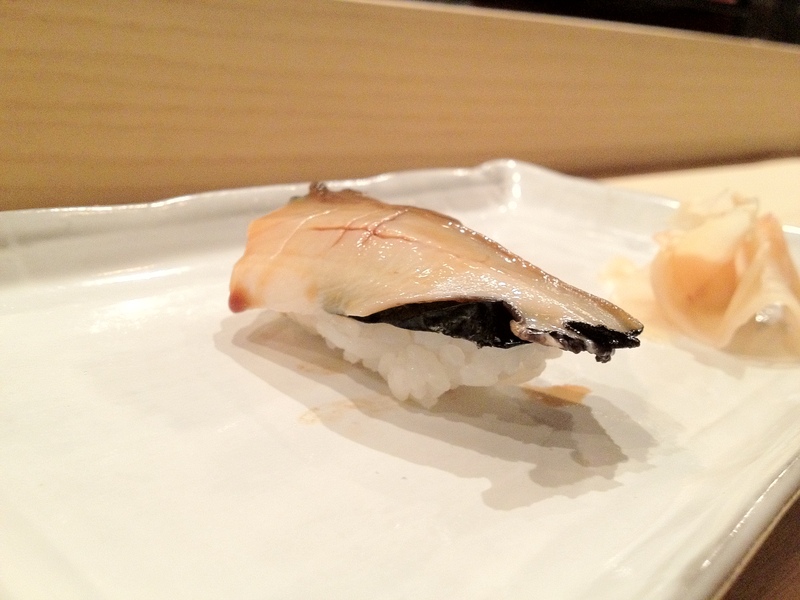 Monte: I think hakozushi is traditionally meant to be more of a quick grab-n-go style of sushi, with benefits of the flavors of the fish being more integrated into the rice via the pressing method. This particular hakozushi at Kura was great – the rice wasn’t super fluffy because of the large ness and denseness of the sushi, but the taste was great. 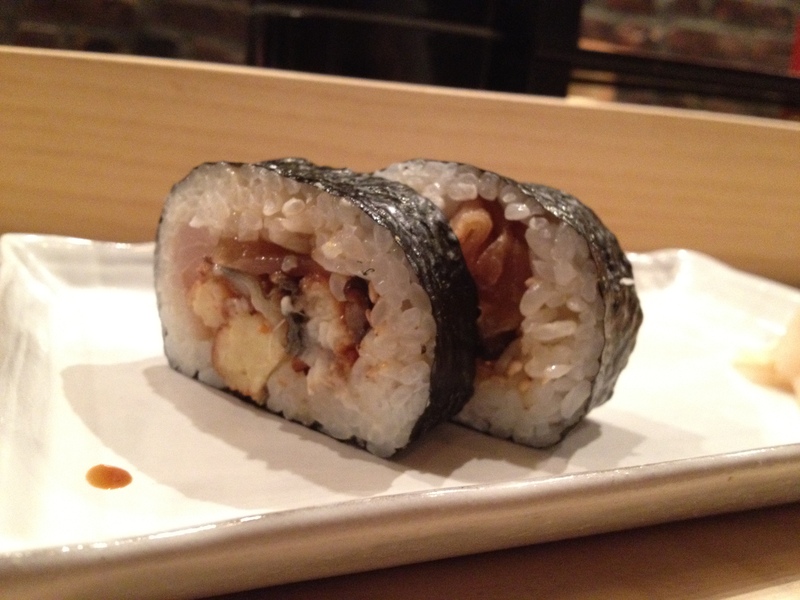 Futomaki with tamago (egg), unagi (freshwater eel), saba (mackerel), kyampo (sp? ), and shiitake mushroom. Victor: I think he was pretty much trying to finish us off with this; he looked kind of shocked when we said that we still wanted more food after hahaha. Monte: Most futomaki I’ve tried are generally mushy and made with pretty cheap ingredients, and this rendition totally upgraded the normal flavor profiles. The mushroom still was very distinct, but the unagi and egg were very sweet and meaty, making for a great bite. 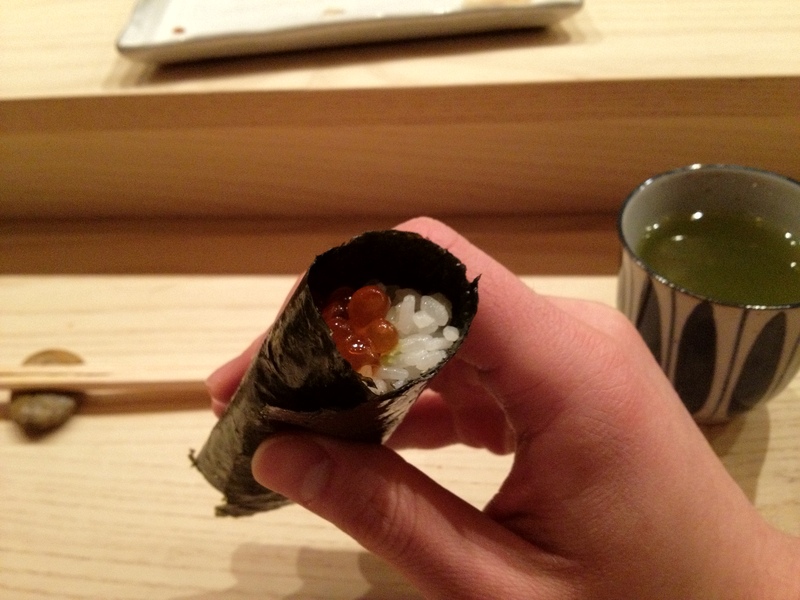 Ikura (salmon roe) hand roll. 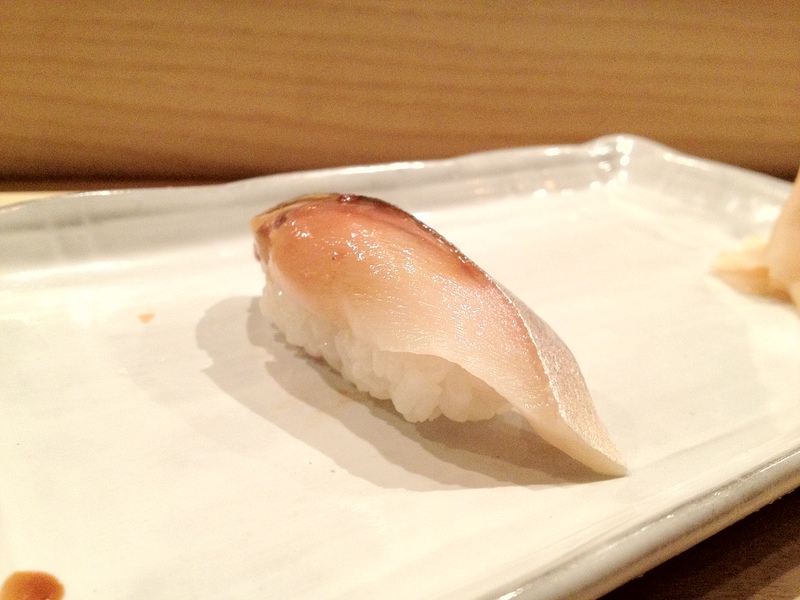 Monte: The ikura wasn’t anything to write home about, but the toasted seaweed was so crispy and made the roll enjoyable. High quality seaweed is something I’ve come to really appreciate. 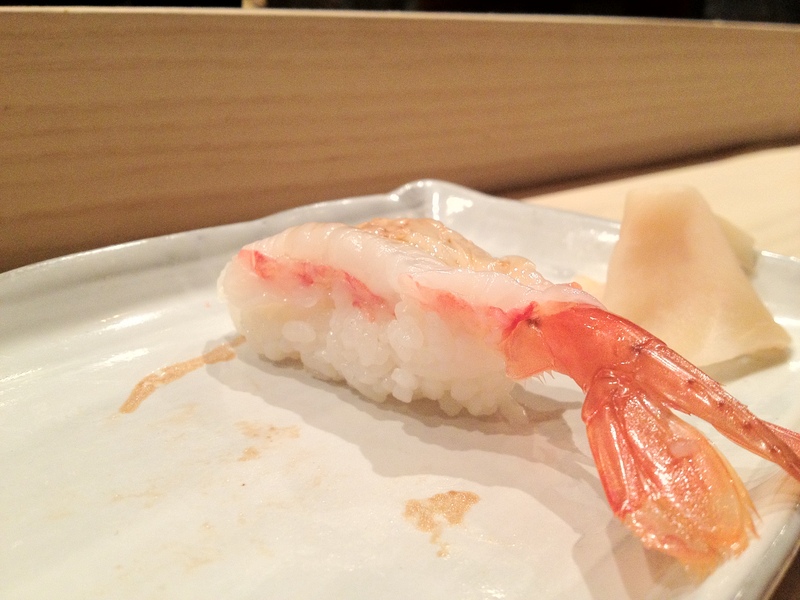 Botan amaebi (Botan sweet shrimp). Victor: We waited for about 15 minutes between the intestines and this piece, and the rice had gotten considerably colder. The rice container was open, and that pretty much caused the rice to cool down and worsen :(. Seared kanpachi (amberjack) with ponzu sauce. Victor: Monty thought this felt rubbery, while I enjoyed the texture. Monte: I don’t know, there was something about the texture that felt quasi-firm. It was almost like the way a gummy bear or jello has that kind of squishy bounce-back quality to them. 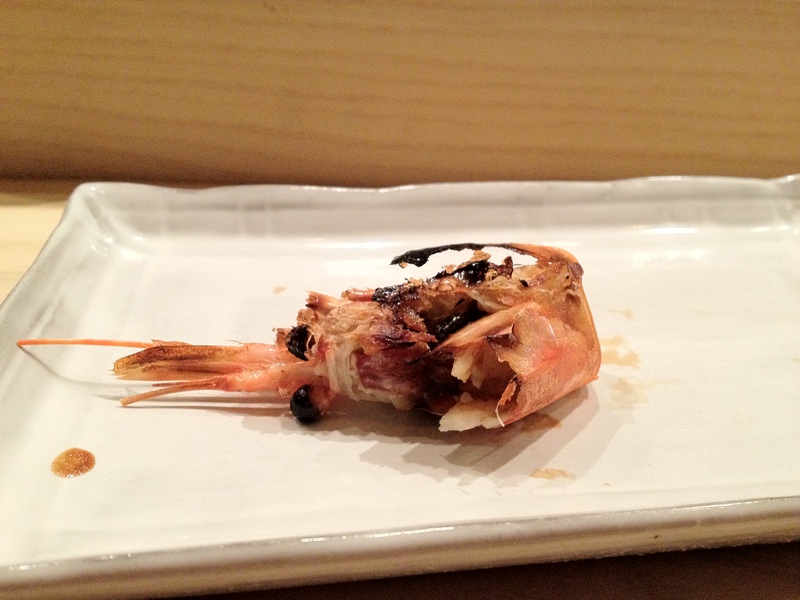 Grilled botan amaebi (botan sweet shrimp) head. Monte: I wish, instead of every calbee shrimp chip I ate, that they had all been this fried shrimp head instead. So crispy, meaty, flavorful, and wonderful. 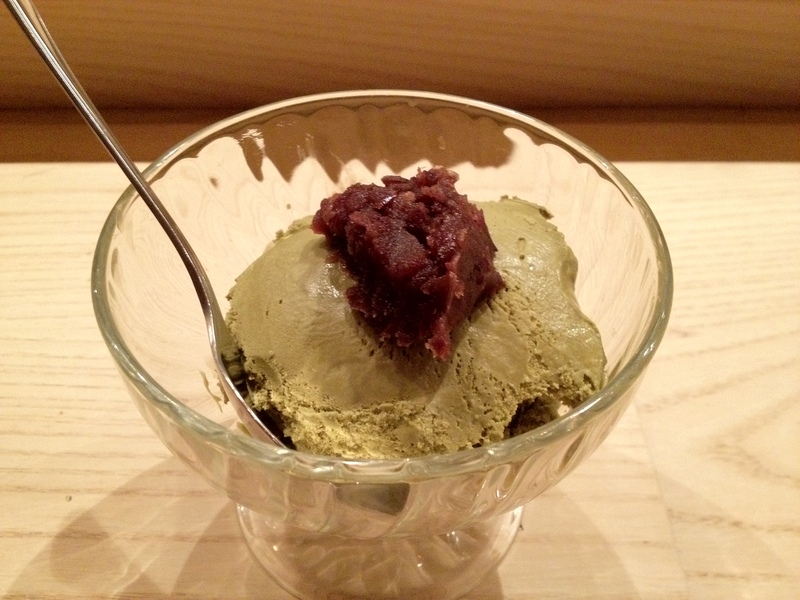 Green tea ice cream with red bean paste. Victor: The ice cream had a saltiness that reminded me a little of salted caramel. This helped prevent the green tea and red bean flavors from being too sweet, and I ended up finishing the dessert… way too quickly haha.